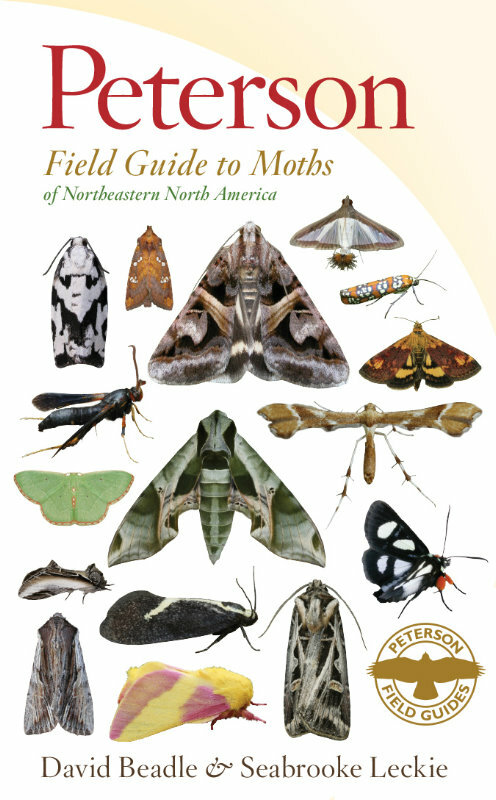 David Beadle and I will be doing a new Peterson moth guide, for southeastern North America! Many of the details are still being worked out, but it will be very similar to the northeast guide in format. 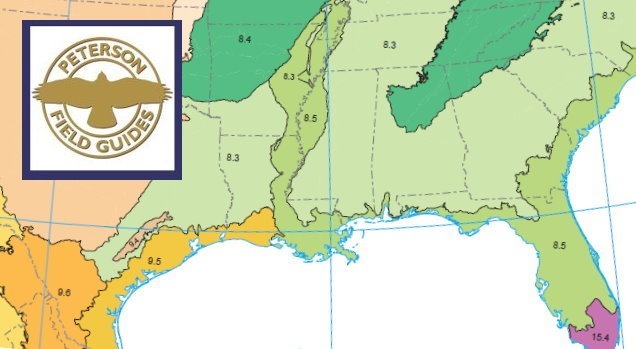 It will contain about 1600 of the most common or flashy species from the region, and will cover the range shown in the map above – from North Carolina to Florida, west to Oklahoma and central Texas. Release date is TBD, but I suspect will likely be about summer 2016. We’ll be working on the materials over the course of the next year and a half, including some travel and soliciting high-quality photos to obtain images of species we don’t currently have them for. 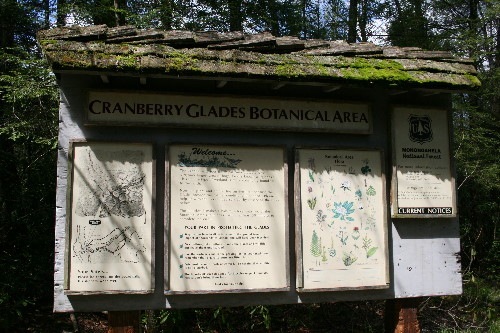 I’m really looking forward to getting out to visit some of these areas this summer and perhaps next. I haven’t talked about it much, but in my spare time I’ve been writing novels. Over the last couple of years I’ve been working at getting better at the craft and writing a really strong story, and last week I finally signed with a literary agent! 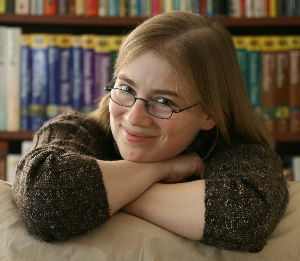 Rachael Dugas of Talcott Notch Literary read and loved my latest novel and offered to represent me and my work. To place your book with large publishing houses you need to go through an agent, and finding a literary agent is more like winning a place with one of the coaches on The Voice (they have to really fall in love with your work for them to offer representation) than it is hiring a realtor – so this was really exciting! Next up, she’ll be working to try to sell it to a publisher for me. I’ve been posting more about my writing journey at my writing blog. Also, Dan and I are moving again! As last time, our landlord has decided to sell the house. We haven’t yet found a new place in the area that will work for us, but hopefully soon; in the meantime, we’ve been busy preparing to move, packing things, and that’s kept us pretty occupied the last little while, too. I’ve been quite busy working on various projects over the last year, and the novels have taken up a lot of my extra time. I ended up having to let something go, and that something was the blog – at 2-3 hours per post, even just a couple posts a week eats up a lot of time. Plus I’d already blogged about a lot of the common and easy stuff where we lived. I may yet come back to it – especially if I were to get a smartphone that I could take photos with and post easily – but I don’t have immediate plans. I do, however, intend to post periodic updates on the status of the new guide. If you’re interested in hearing the latest you could check in from time to time, subscribe to the blog through an RSS feed reader, or by email (click the “Follow” button at the top, if you’re logged in to WordPress). I’ve been doing that thing again where I get distracted by other projects and forget to post here. Sorry about that. It’s been a busy month and promises to be a busy month to come. Here’s something from a few weeks ago. One morning Dan discovered this guy (or gal?) on the screened-in porch. I believe it’s a Little Brown Bat Big Brown Bat (thank you to PFG to Mammals author Fiona Reid for correcting my ID! 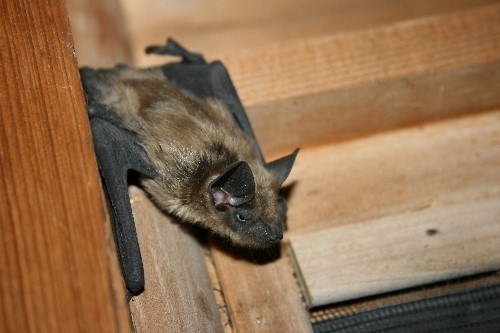 ), one of the most common around here; we’ve got a colony of these (whichever species they are) that occasionally take up residence in the cracks of the beams above our front (open-air) porch. They’ll stay for a few days then move to a different roost for a while. We always know when they’re there because the porch beneath becomes littered with bat droppings. 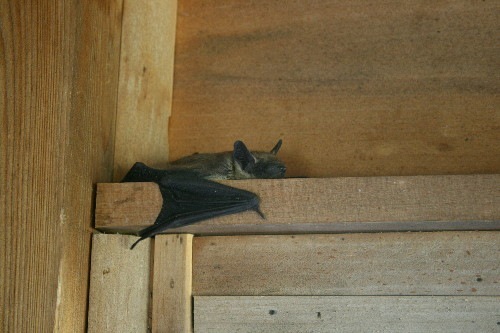 Dan propped open the door hoping the bat would let itself out while he took care of some chores inside, but when he returned a while later it had settled down on some trim up near the ceiling and fallen asleep. I’ve heard that you’re not supposed to move bats during the day, and since it wasn’t at risk of bothering anyone there we decided to leave it till evening. It stayed put, barely moving, till dusk. As the sun started to set it began to shift. It crawled over the edge of the trim and hung there, tucked into the corner, still looking very sleepy. I decided that was my cue to shift him outside; we’d let the cats come out while the bat was asleep (they’d remained completely oblivious) but once it showed signs of waking up I didn’t want to take any chances. I donned gloves and got a kitchen towel to collect it up in. Unfortunately, in my concern about injuring it my grip wasn’t firm enough and it slipped out. Still dozy, it basically glided to the floor where it sprawled with its wings out. What a neat opportunity to see the intricate structure of the wings and tail. And look at those tiny toes on the back feet! They and the thumb, at the “wrist” of both wings, are long and thin and designed for clinging to stuff since the bat doesn’t really have the option of using its hands. Still, it’s more than birds have. Those wing bones are incredibly thin and delicate. Birds, of course, have evolved to have hollow bones that helps to reduce the amount of weight they need to get airborne. 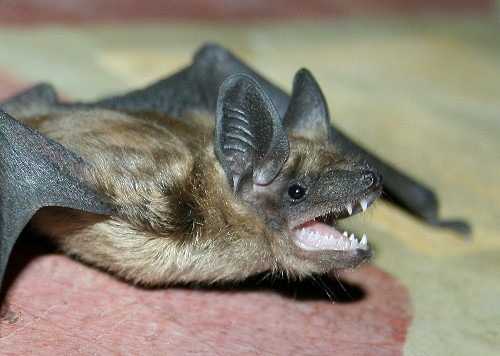 Bats don’t have hollow bones so they just have to be smaller in the heavy bits. 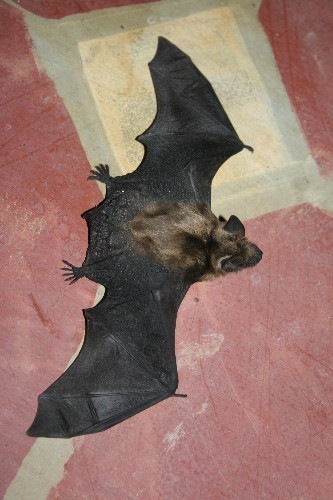 It also helps, however, that the long finger bones allow bats to make shapes with their wings that other flying creatures (birds and insects) can’t – they use this for producing novel mechanisms for increasing lift, to compensate for their greater weight. Those big ears are important for catching the sound as it bounces back. It’s a complex skill involving the measurement of time between making the sound and hearing the echo, the time between hearing the echo in one ear versus the other, and the intensity of the sound for one ear versus the other. This is mostly done instinctively, below the level of consciousness. We do some of this ourselves already, in being able to identify from which direction a sound has come from. The only difference is that the bats are listening for echoes of sounds they produced themselves. Remarkably, it’s possible for some blind or visually challenged people to develop a form of echolocation to help them navigate their world. Their visual cortex is repurposed for processing sounds instead of sights. The YouTube video above (also here) is an amazing example. 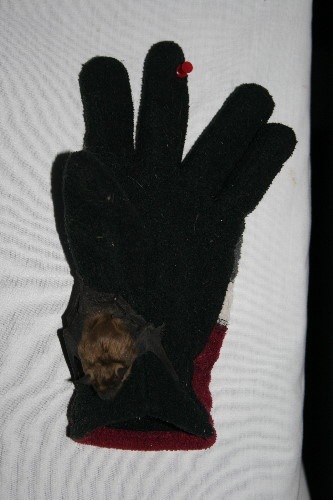 The bat climbed up onto my glove easily once it was on the floor, and I took it and tacked it up to the side of the house (a convenient advantage of wooden logs). It still seemed sleepy and not ready to head out yet, so I left it; when I checked back half an hour later, it had gone. This week is National Moth Week, seven days of mothing across the continent (and around the world!) in celebration of these diverse creatures. From now through Monday the 29th, turn on your porch light, put out a blacklight and sheet, mix up some sugar bait, or just search your yard to see what moths you can detect. Or, if you’d rather, join in one of the public mothing events scheduled for your area. Reigster your event and report what you find after it’s done. Don’t worry if you can’t identify many species! Moth’ers of all skill levels are encouraged to join in and have fun seeing and learning something new. All registered participants are eligible to win a signed book – many authors, including myself, have donated books to the event that will be given away by random draw at the end of the week. 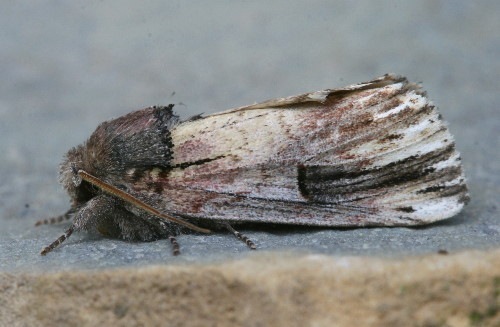 You can check in at the NMW official blog to see what’s going on in other areas during moth week. I had been hoping to run a public event myself, but it didn’t work out timing-wise – it’s been a busy period for me recently. Still, I’ll be turning on my lights a few times and recording what I see. Last night I was at my parents’ house and put out my light for a few hours to kick of NMW. We’d just had a rainstorm roll through late in the afternoon so abundance was lower, but there was still good diversity. The indisputable highlight for me was this Chestnut Schizura (Schizura badia), a lifer for me and a species neither Dave nor I had photos of when we prepared the field guide so we had to solicit one from someone else. It’s nice to add it to my digital collection! Yesterday afternoon while heading out with the dogs to see if I could relocate a Common Buckeye butterfly that Dan had seen in our back fields (they don’t typically occur up here, so this was a really rare sighting), we startled some wildlife in the tiny patch of trees that the trail passes, no more than a couple dozen feet across and a few dozen feet long but dense enough at the edges to make it hard to see into. The dogs were, of course, intensely interested and my focus was on preventing their pursuit of the thing; so it didn’t immediately register that the sound of departure was not the bounding ba-dump, ba-dump of alarmed deer but something more shuffling. Then when I seemed to hear something climbing a tree I thought it must be a porcupine, which I also did not want the dogs taking off after. 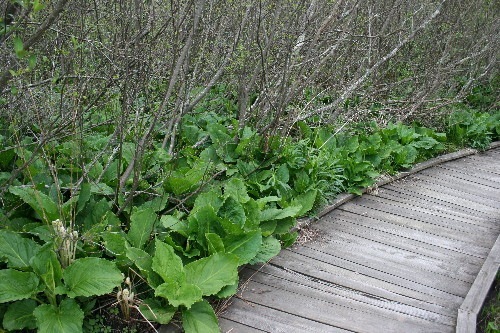 But when I got Jack secured and Raven to heel and peered through the foliage, what was looking back at me was not a porcupine. Or a deer. I was too surprised to move, at first. 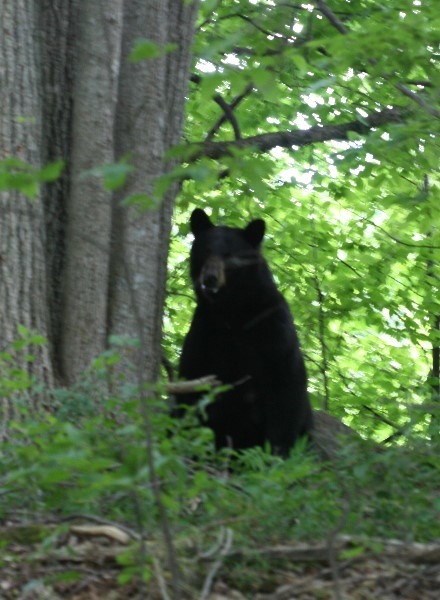 But the bear seemed more cautious than aggressive, and after a moment I relaxed, a little; enough to pull out my camera and try for a few shots. 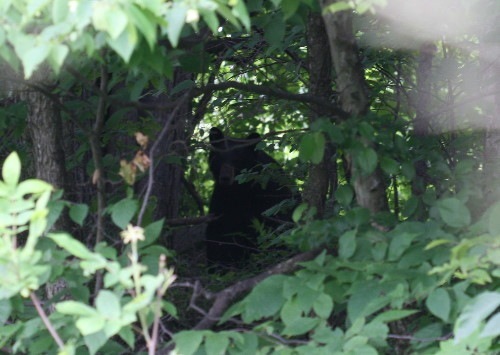 She was tucked in behind a wall of vegetation through which I had just a small window to see her, but I got a couple of photos that were recognizably of a bear and was content with that. Carrying Jack, and with a firm verbal leash on Raven, I turned and carried on down the trail so she could leave. 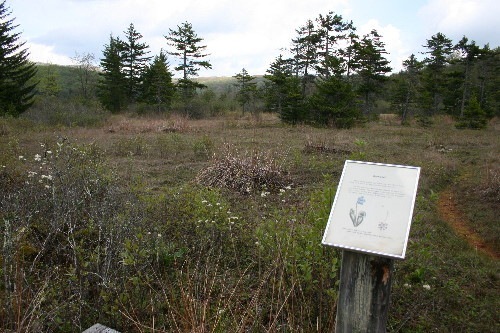 I made my way slowly to the field where Dan had seen the butterfly and dawdled around there for a bit (didn’t find it). Then I started to mosey back, pausing a couple of times to take photos of things. By the time we returned to the woods patch the bear had had lots of time to clear out, but I still picked Jack up and approached slowly, just in case. Cautiously I peered through the trees to the spot she’d been, but the patch was empty and silent. Relieved, I set Jack down. She’d made some marks on the trunk that I wanted to check out, so I started picking my way through the trees toward where she’d been. 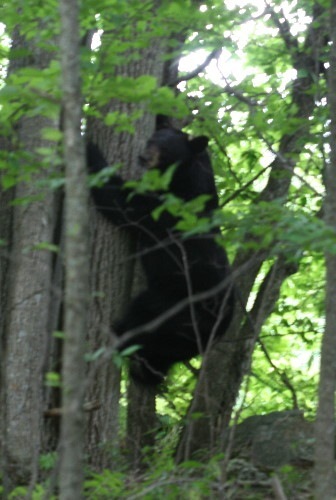 Halfway there, when I was about twenty-five feet from the target tree, there was a soft grunting growl and the bear sat up on her haunches beside it. Panic! Panic! Call the dogs back! Jack, come! Raven, heel! Now! Thankfully, both dogs came quickly, and I turned my shoulder to her to show her I was not trying to threaten her (even while keeping her in my sight, just in case!) and started to casually leave the forest patch. She didn’t say another word as she sat back and watched me, alert and uncertain but staying her ground. I paused near the edge of the trees, since she wasn’t moving, and took a couple more (quick!) photos without the obstruction of leafy vegetation, then left. It wouldn’t surprise me if that were the case. Last fall I found evidence that was very suggestive of a mother bear with a cub. Female bears mate every other year, and take two years to raise each cub. If the second animal of last year’s discovery was in fact a bear cub, it’s possible it was a second-year cub that was weaned before the winter, and this is the same mother bear with a new baby. 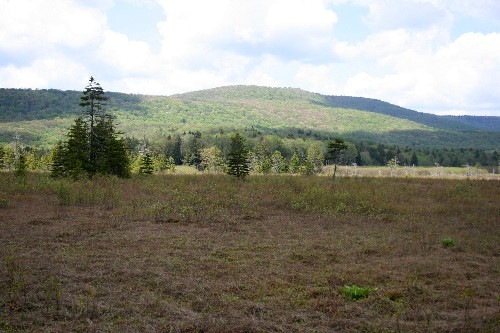 Female bears tend to have home ranges of 1600 to 6400 acres (2.5 to 10 square miles; which is about 6.5 to 26 square kilometers); certainly not small, but not so large that the same animal wouldn’t pass through an area semi-regularly, especially if she had favourite haunts. It was exciting to finally get a chance to glimpse our local bear, since in the three years we’ve been here we’ve seen lots of evidence of their presence but no actual bears. I kind of wish it had been at more of a distance… but hey. Luckily, she was calm. It makes me happy to know she’s out there, somewhere, and passing through from time to time. 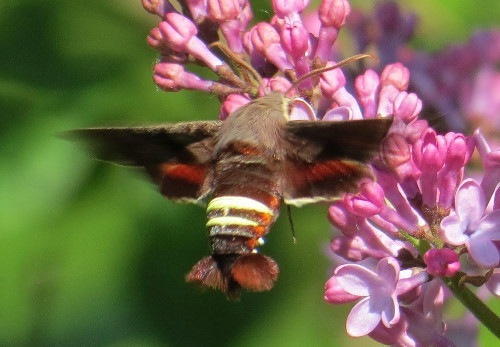 Our lilacs have been done blooming for a while now, but in the days following my return home from the book tour they saw a lot of activity from pollinators: bees and butterflies, flies and moths. Including these three, which happened to all show up at the bush by the house during the same afternoon; an extremely rare treat. 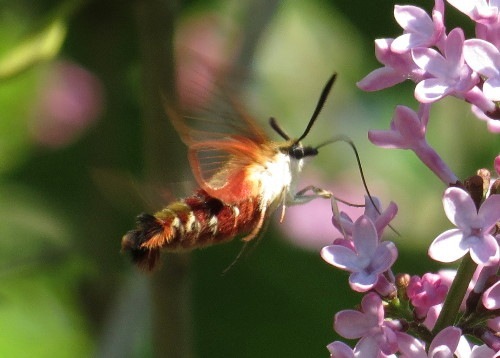 The above is a Hummingbird Clearwing (Hemaris thysbe), sometimes referred to as a “hummingbird hawkmoth”. It’s the most common diurnal sphinx moth around here, and nearly all of my sightings of sphingids at my garden flowers are this species. 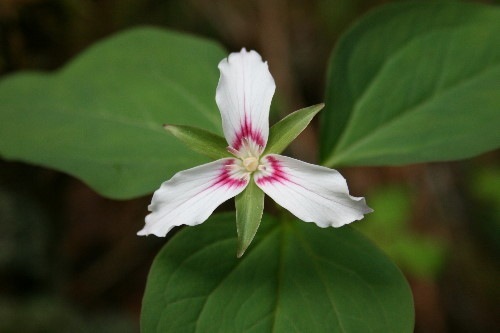 They’re reasonably abundant, with near-daily sightings once our phlox and bee-balm/bergamot start blooming. The name, of course, comes from their resemblance to mini hummingbirds, with which they share the same behaviour of hovering in front of flowers while feeding and darting quickly from one bloom to the next. This one is the closely-related Snowberry Clearwing (H. diffinis). I’d never seen this species before, so I was pretty excited when Dan found the individual and called me over. He’d actually seen them once, earlier this spring, down in Frontenac Provincial Park near where we used to live at the lake house. I think they’re probably relatively widespread around here but simply not very abundant. They’re actually found across more of the continent than Hummingbird is. While the Hummingbird has a fair bit of red to it and a solid green back, the Snowberry lacks much red and shows two pale stripes running down each side of its back, giving it a yellower look. There’s a third species, too, Slender Clearwing (H. gracilis), which is similar to Hummingbird but has a white border along the red and a red stripe going up the side to the eye; it’s the most uncommon of the three (I’ve never seen it) and restricted to the northeast. 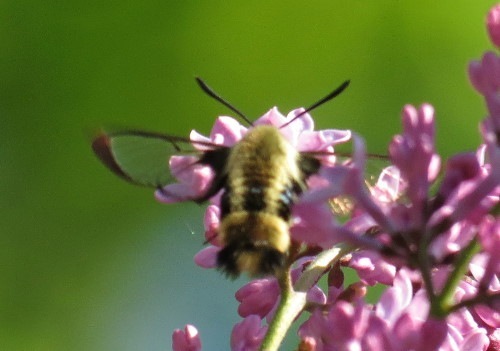 All of the members of genus Hemaris are called clearwings because of (duh) their clear wings, though they also share this common name with a group of wasp-mimic moths that also nearly all have clear wings. 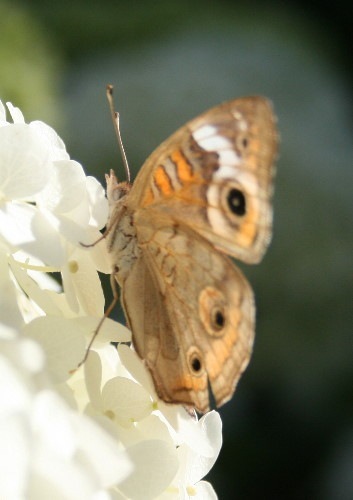 And the final species to show up at our lilacs was a Nessus Sphinx (Amphion floridensis). I had actually seen this once before, but not very well and not for very long, and hadn’t really gotten a good photo. So I was quite pleased about this one, too. 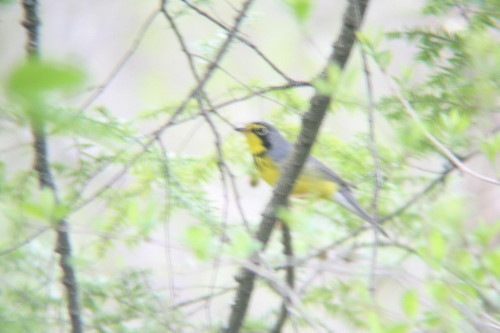 Unlike the other two, this one belongs to a different genus and has solid-coloured wings. The distinctive identifying feature is the pair of yellow rings around the abdomen (though these can sometimes be single; this might be a regional variation, I’m not certain). 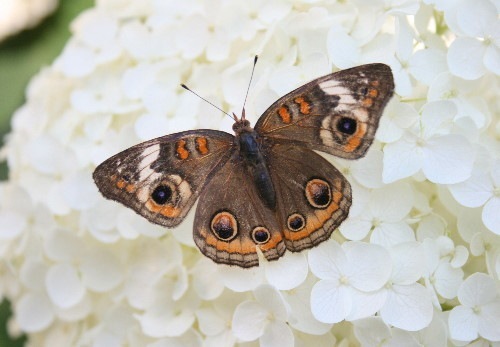 The three species fly most of the year, from mid-spring till the end of summer, so even though our lilacs are done blooming now there will still be the opportunity to encounter them again. Definitely the Hummingbirds will be back once the phlox starts to flower.